Sidewalk’s End Farm is located in the city of Portland, Oregon. We farm five city plots and one large rural one, focusing on northwestern hardy, late season, and storage crops. The farm was started by four people–Holly, Jud, Rachel, and Tom–who lived and gardened together for three years until we decided to make our large gardens pay for themselves by selling CSA shares. Things grew quickly, and now, in our second season, we are growing for a 20-member CSA and two farmers’ markets, as well as cultivating barter and work-trade relationships. 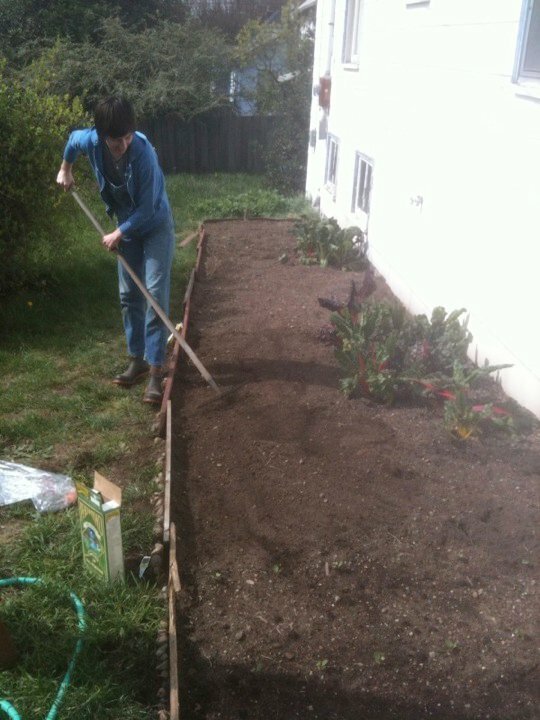 We borrow backyards and empty lots and trade produce to our generous land-lenders. What difficulties have you had, or are you overcoming, and how? In our first season the major challenge was figuring out how to operate as a small business. Even though we all had extensive agricultural experience, the business end of things was a serious seat-of-the-pants endeavor and major learning experience. We would have done well to reach out more to other farmers and small business owners in search of advice and mentorship. 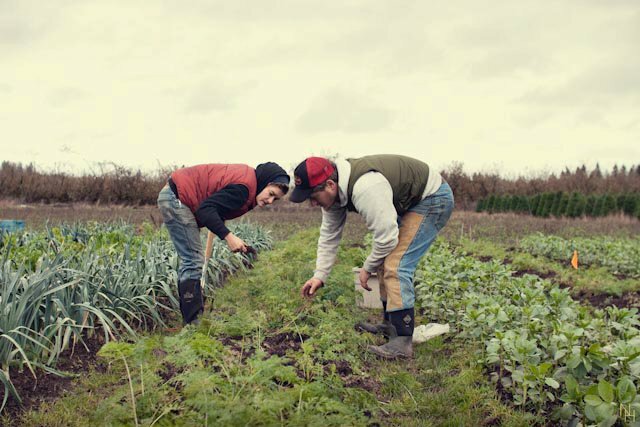 But our lack of business savvy has perhaps allowed us to be more creative and include aspects of barter, work-trade, and shared reciprocity into our farm. Our other primary obstacle–both for getting by and being good farmers–is trying to run a small, economically viable farm in the city, where we pay city rent and cannot live on our land, have city water rates, have limited access to land, and are compromised by jobs, transportation, and the logistics of keeping multiple plots with different conditions and crops in mind. What are your goals in the next 5-10 years? We are working hard to find a piece of land where we can expand our growing area and be a community presence beyond just growing and selling produce. We want enough space to have animals, on a small scale, and expand our grain production and dry bean production. We also want to be able to use the piece of land we find to offer space for workshops and education, and host meetings and events for other groups and projects here in town, like Right 2 Survive, a radical houseless group. Ultimately, we are interested in more ways to make the farm part of a fiercer, more resilient force counter to conventional land ownership, inaccessible food, and contemporary capitalism. What advice do you have for other young farmers who are just starting out? Work for and learn as much as you can from other people. Do apprenticeships and internships for at least a few years to make sure you actually like it. Educate yourself about the realities of farming, national and local farm policy, and what people in your area want and need. Decide what you are able to do, what parts of policy you want to comply with and want to ignore. Learn where you live and farm and try to figure out what will make the most sense for where you are. Consider that unless you are already wealthy, you will certainly be real poor for at least a few years. Get okay with being poor. Save your money. Figure that you might have to start, quit, start over, try something different before you really get your farm going. How (if at all) do you see your work as a farmer fitting into the larger movement for social change from the ground up? Our food economy alone has a long ways to go. As farmers we get our hands dirty every day with these questions, and maybe by continuing to farm we can figure out some answers. Since we’re in the city, I think we can play an interesting part in building stronger bridges between urban and rural areas. We are also really excited about the possibilities of extending our farm beyond specifically agricultural and food-related concerns, which is part of our long-term vision. We can, and have, learned a lot from non-farm organizing, counter-economies, and forms of support, and hopefully this can be huge for our ability to seriously impact the limited availability of wholesome food in our area–not just for us, but other small food producers as well.